10am – 3pm each day. Suitable for children 3 – 7 years. Our Junior Pony Days are great for children of any riding ability who love being around horses and would like to learn more about them. On the day children will do a mixture of pony care sessions which may include mucking out with our special mini forks and brooms, grooming the ponies, learning about feeds, tack, rugs bandages and much more. Children will also take part in a fun riding session – usually a gymkhana with team games and races on the ponies. Each of the pony days through the summer will include a variety of activities so ideal if children would like to attend more than one, or even all of them. Snacks, drinks and lunch is included and all children will receive a Hartwell Rosette at the end of the day. 9:30am – 3:30pm each day. Suitable for children 7/8 - 11 years. The Senior Pony Days are ideal for children with any level of experience who are keen to learn all about horses and stable management while having fun. Throughout the day children will take part in a multitude of activities which may include grooming sessions, learning about general day to day care of horses including mucking out, feeding, rugging up, haying etc., sessions on equine and rider first aid and much, much more. Children will also take part in a fun riding session such as a gymkhana or obstacle course on the ponies. 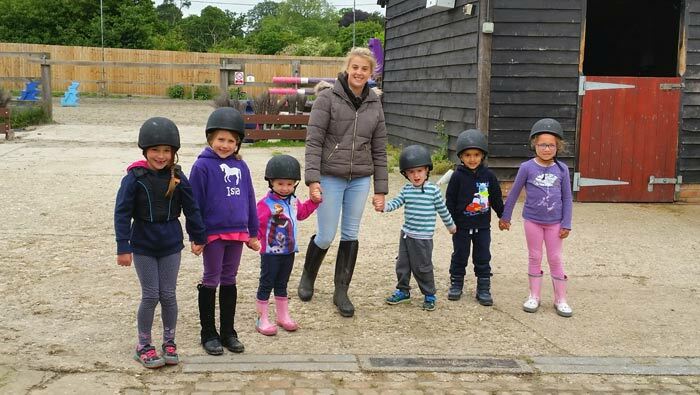 Each of the pony days through the summer will include a variety of activities so ideal if children would like to attend more than one, or even all of them. Snacks, drinks and lunch is included and all children will receive a Hartwell Rosette at the end of the day. Our fabulous teddy bears picnics are ideal for children 3 years and up of any riding ability as can be on lead rein / have a walker. Children will take their favourite teddy bear on a wonderful hack through the Prune Farm Stables fields, play games, do an Easter egg hunt and have a picnic. We provide a pack lunch so children need only bring their favourite teddy with them. Only 4 spaces per picnic so book early to avoid disappointment. The 1hour jump clinic is perfect for any riders who have done little to no jumping but can competently walk &amp; trot off lead rein or even if they have completed previous jump clinics but would like to gain more confidence and experience. Within the hour session riders will learn the basics of jumping and begin putting this into practice over some small fences. The class may include work on jumping position, trotting poles and possibly some cantering depending on rider level. The clinics are limited to 4 riders per clinic to allow maximum benefit for all riders. Rosettes awarded to all at the end. £50 per person (payment on booking). This comprehensive Stable Management day is suitable for children / teenagers of all abilities who would like to learn everything needed to own their own horse or work with horses in the future. The day will involve lots of practical horse care sessions which may include mucking out, grooming, bandaging, first aid, lunging, tacking up, rugs and much more. There will also be a 1hour group riding lesson tailored to individual abilities. Rosettes awarded to all who take part. Only 10 x spaces available. Bring own pack lunch. The 90minute level 1 jump clinic is perfect for those riders who are passionate about jumping want to complete an intensive jump training session. Riders must be able to walk, trot, canter and jump un aided. The session will include warm up exercise to work on position and learn about striding and course / grid work. There will be follow on clinics for riders who complete the level 1 jump clinic in the next holiday. Rosettes awarded to all who take part. Clinics are carried out in a large outdoor arena with full set of show jumps. There will be a maximum of 6 riders in the clinic to ensure riders get the most out of the session. Bring the fun to Easter with a fantastic gymkhana filled with games and races and then go on an exiting Easter Egg hunt through the cross country fields (this part will be on foot for safety). Suitable for all levels of rider from 10yrs and up, races will be run according with ability and so it is fair for all teams. Bring some lunch to enjoy between activities… or just fill up on chocolate, it is Easter after all! Rosettes for all who take part. Our exciting cross country lessons will be a great chance for any riders who have completed previous cross country lessons to build on what they have learnt or competent riders to have a first go at cross country (please discuss with you instructor suitability for this). Sessions will build slowly so riders can gain confidence, learn cross country technique and most importantly have fun! Lessons are capped at 3 riders per session to allow plenty of individual focus. All riders must have a hard body protector, any riders with air jackets will need to wear a hard body protector as well. As the session in 90min long and might be quite tiring please bring a water bottle. Rosette for all who complete the lesson.